Here’s an interesting idea: two bikes in one. It’s called the Boxer SSR, and it comes with a bodywork kit that transforms the naked roadster into a fully-faired sportsbike. Boxer Design is one of those tiny but occasionally interesting small-scale European marques. 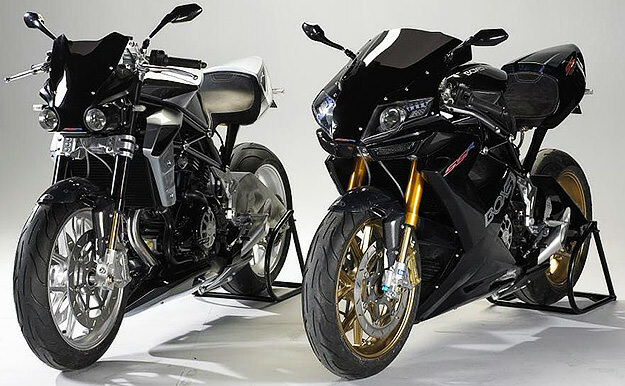 The French outfit is best known for the Lamborghini motorbike—and concept machines such as Aprilia’s lovely Blue Marlin, the Voxan UB1, and the even more obscure Mondial Nuda. The SSR has the V-twin 997 cc motor found in previous Boxer models, plus quality components such as Öhlins suspension. Launched in 2005, the SSR’s planned production run was 300: we’ve no idea how many, if any, have actually been built. Image via Dutch site Motorencyclopedie.